Our Ageing & Dementia Research Centre (ADRC) at Bournemouth University (BU) brings together cross-faculty research expertise in areas of ageing and dementia. At a time when our population is living longer and often with long-term conditions including dementia, the centre’s research significantly impacts on theory, education and professional practice. The aim of ADRC is to use the team’s collective expertise to develop person-centred research which will improve the lives of people with dementia and their families. Their research falls under three broad categories – developing ageing & dementia friendly environments, nutrition & wellbeing and activity & social inclusion. Each topic builds on a wealth of research knowledge and projects already taking place at BU. People with dementia often find it more difficult to understand and navigate built environments. Dementia-friendly environments compensate for impairments to maximise independence and quality of life. We conduct research into the design of supportive dementia-friendly environments. 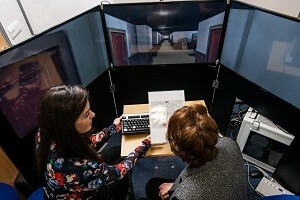 ESRC-funded project “Dementia-friendly architecture: Reducing Spatial Disorientation in Dementia Care Homes”. Dementia-friendly architecture: what do we know and where do we go? Please click on this link Nutrition & Dementia to find out more about this project. People with dementia, their carers and families need access to information, advice, support, care and treatment, at a time when it is relevant for them. This can be challenging for service providers. Our interventions and evaluations research drives forward innovative practice in all aspects of health and social care provision for people with dementia. This includes best practice in health promotion, health and social care delivery, and helping carers and families to support the person with dementia. The AD-GAMING Project is an ERASMUS+ funded project that aims to develop a Training Platform (website and instruction guidance documents) to support the use of Serious Games that can enhance the Quality of Life of people with dementia. The project team is led by Alzheimer’s Valencia and is supported by five European partners: Bournemouth University Ageing and Dementia Research Centre (ADRC); Alzheimer’s Slovenia; Alzheimer’s Romania; Alzheimer’s Greece and; the Institute of Biomechanics of Valencia (IBV). Phase 3: Evaluation of the online training platform and training documents. Awarded to: Dr Shanti Shanker (PI) & Dr Ben Hicks (Co-PI) . Title of the Project: BRANES – Building Resilience and Awareness through Neuropsychology Education in the Society. (b) Using creativity to improve resilience in adults (with Neuropsychological lesions or neurodegenerative disorder) and in School Students. Caring UK magazine, Dec Issue : What’s best practice to deliver good nutritional care for people with dementia? Duah-Owusu White, M., Vassallo, M., Kelly, F., & Nyman, S. R. (2017). Can a systems approach reduce adverse outcomes in patients with dementia in acute settings? (innovative practice). Dementia, published online November 3, DOI: 10.1177/1471301217737690. Wagland, R., Bracher, M., Drosdowsky, A., Richardson, A., Symons, J., Mileshkin, L., and Schofield, P. (2017) Differences in experiences of care between patients diagnosed with metastatic cancer of known and unknown primaries: mixed-method findings from the 2013 cancer patient experience survey England. BMJ Open. to promote participation in physical activity among people with dementia. British Journal of Health Psychology. Lester, A. W., Moffat, S. D., Wiener, J. M., Barnes, C. A., & Wolbers, T. (2017). The Aging Navigational System. Neuron, 95(5), 1019–1035. Hartmeyer, S., Grzeschik, R., Wolbers, T.and Wiener, J.M (2017) The Effects of Attentional Engagement on Route Learning Performance in a Virtual Environment: An Aging Study. Frontiers in Aging Neuroscience, 9, 235 – 235. Nyman, S. R., & Skelton, D. A. (2017). The case for Tai Chi in the repertoire of strategies to prevent falls among older people. Perspectives in Public Health, 137(2), 85-86. Cutler, C., Hicks, B. and Innes, A., 2016. Does Digital Gaming Enable Healthy Aging for Community-Dwelling People With Dementia? GAMES AND CULTURE, 11 (1-2), 104-129. Cutler, C., Palma, P. And Innes, A. 2016. Tales of the Sea. Dementia: The international Journal of Social Research and Practice. McParland, P., Cutler, C. And Innes, A. 2016. The challenges of implementing and evaluating a pilot music and movement intervention for people with dementia. Dementia. The international Journal of Social Research and Practice. Smith, M., Atkin, A. And Cutler, C. 2016. An age old problem? Estimating the impact of dementia on past human populations. Journal of Aging and Health. 17 October 2017 : Nottinghamshire Healthcare, “VOICEs in dementia care: the science and practice of communication. 3-6 September 2017 : 20th conference of the European Society for Cognitive Psychology (ESCoP), Potsdam, Germany. ADRC have an interactive event “Growing up and getting old”. A very well attended event with lots of interaction. All ADRC staff were in attendance. Heward, M., Murphy, J., Board, M., Spriggs, A. and Emerson, L.
29 June 2017: Quality Matters Conference, Poole, Dorset. 25 May 2017 : Alzheimer’s Society Memory Advisory Dorset wide meeting (Durweston, Blandford). Prof. Jane Murphy gave a presentation about ADRC whilst Dr Ramona Grzeschik, Christopher Hilton and Iram Bibi represented ADRC and disseminated current research projects. Prof. Jane Murphy, Michelle O’Brien and Yolanda Barrado-Martin represented ADRC at the Poole Dementia Action event held at the Spire Church, Poole High Street. Natalia Adamczewska and Yolanda Barrado-Martin represented the Psychology Department and the ADRC. The theme of the congress was “Developing Collaborations across Professions and throughout Europe”. Joanne Holmes and Dr Swrajit Sarkar represented ADRC at the festival at the RNLI college. Prof. Jan Wiener attended as an invited speaker and panel discussion member at the Models and Representations in spatial cognition workshop hosted by the Cognitive Neuroscience Department, University of Tuebingen. The title of this event was “Commissioning priorities and current view of the care home market (supply, demand, quality and sustainability)”. Prof Jane Murphy (presented) and Dr Ramona Grzeschik (represented ADRC). Others in attendance were Skills for Care, Partners in Care, Bournemouth Borough Council, Alive, Equipped for Living and Bournemouth’s Workforce Development Team to name a few. Prof. Jane Murphy, Dr Michele Board and Joanne Holmes presented at the Research Networking and Innovation Event on “Nutrition and Health in the Older Person”. Prof. Jan Wiener was an invited speaker, his presentation was “What can eye-tracking tell us about the cognitive mechanisms underlying successful navigation”. Prof. Jan Wiener, Dr Michelle Heward, Dr Ben Hicks and Iram Bibi represented ADRC at the “Living with Dementia 2017” conference. Prof. Jan Wiener was an invited speaker at the German Centre for Neurodegenerative Diseases. Presentation entitled “Learning routes through real and virtual environments: the effect of (a)typical ageing.